Since its introduction eight years ago, the à l'ancienne violins have become the flagship of the Jay Haide fleet. They are envied and copied by other makers, but as much as they have tried, none have come close to equaling them. Some have gone so far as to put facsimile labels of well known French and Italian makers in our instruments and selling them at much inflated prices. One of our ancienne violins even was given a certificate of authenticity from a well-known expert as an early 20th. century Italian violin with an insurance appraisal for $26,000.00! Because of this, every one of the à l'ancienne violin, viola, cello and bass now has a series of brands inside and out to deter the copyists. With use and playing, fine old string instruments develop the patina of age over the decades and centuries that master violin makers have attempted to emulate, even as early as the late 17th century. By the mid 19th century, makers like Jean Baptiste Vuillaume and Georges Chanot in Paris had developed a high degree of skill in re-creating the effects of time and use in his violins. In following that tradition, each Jay Haide l'ancienne is carefully and painstakingly hand varnished to emulate the appearance of a fine old Stradivari or Guarneri violin. First we re-create the color, texture and patina of the golden ground coat. To that we add our beautiful golden orange varnish in a pattern simulating the wear and use found in the great classic old instruments. In order to do that. we have provided our luthiers with fine old Italian and French so that they can be studied while they are working. It is this attention to detail that has made our ancienne instruments in demand around the world. Jay Haide à l'ancienne violins are available in Stradivari, Guarneri, Guadagnini and Balestrieri models for $2,400. The Special Model is made with European wood, priced at $3,400. 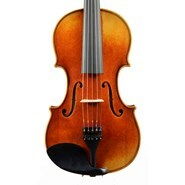 This special model represents an excellent alternative to our regular European wood violins. The European wood used for this model was chosen for its tonal qualities and is offered at an ideal price point. These violins project with rich warmth and great power. Jay Haide Statue Model violins are available in Stradivari, Guarneri, Guadagnini and Balestrieri models for $2,8500. This violins are a great choice for the intermediate student. 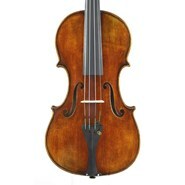 The Model 104 would also be a good choice for a "second" or "picnic" violin for the more advanced player. For the advancing musician, the model 104 was created using beautifully flamed aged maple and an attractively shaded golden orange varnish of a softer texture. The tone is full and warm. These violins are a great choice for the beginning or intermediate student. Since 1992, the Jay Haide 101 has been our most popular model, both for students and as second or "picnic" violins for the more advanced player. Attractively priced, these instruments offer real value for the money. They are beautifully made and have an attractive uniform golden red varnish similar to some of the contemporary Cremona makers. They are available in full as well as fractional sizes; from 7/8 size down to 1/8 size.